Carrot chips? And how. I could have a pile of these, call it a meal, and be the better for it. They aren't bad for you, like many chips. They are not deep fried; no preservatives or other unmentionables are added. All that will rest on your palate is thinly-sliced, roasted carrots. All you need is a glugg of olive oil, a hearty pinch of coarse salt and carrots. I am a big fan of trying new vegetables, or new shapes or new products. My family snacks on a lot of baby carrots; in the store recently I saw a bag of sliced carrots. They looked like ruffled chips. As I often do, I figured: different shapes, more interest. Why not? (if you don't have waffle sliced carrots, just buy regular carrots, slice them 1/4 inch thick, at a slight diagonal. A mandoline might work if you can maintain slices between 1/4 - 1/8 inch). Dinner appeared (as it often does: out of no where, and an hour too soon) and I tossed them on a cookie sheet with a sprinkle of oil and coarse salt. And tossed them so each carrot had a smear of oil; they are awesome. WAY better than fries or chips. Don't believe me? Try them. It just gets better: the other day at the grocer, I saw tri-colored carrots. Have you seen them? You can buy orange, white or purple carrots. I will be buying those next---this humble little side dish just became hip. 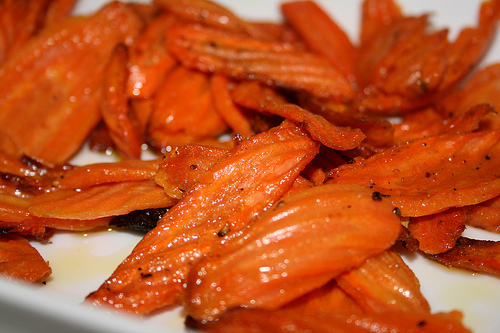 Toss carrots with oil, in bowl or with hands. Spread in single layer on cookie sheet. Sprinkle with salt. Roast in 400 degree oven for 25-30 minutes. (Sometimes I pump it up to 425).